So we have already shown you how/what to pack when traveling to Iceland and how to (somewhat) stay on budget. Now the most important part, what to see/do?! 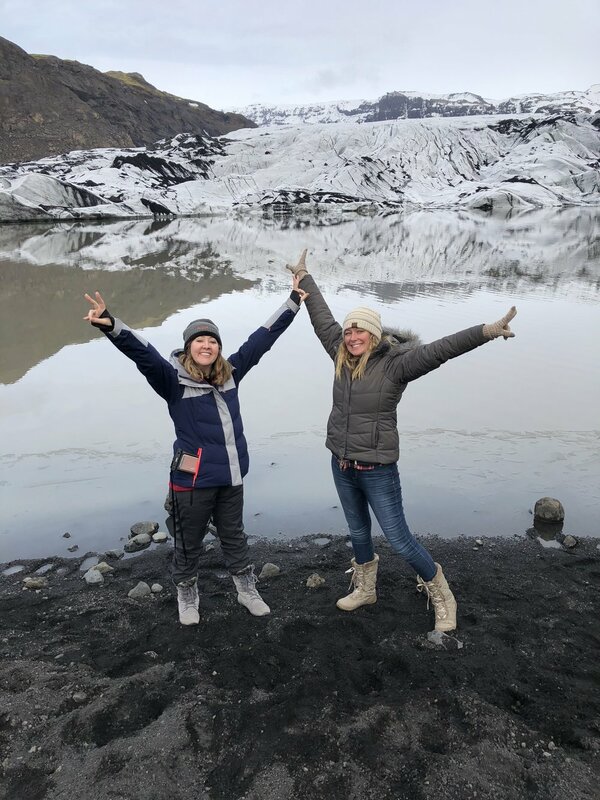 Iceland is known for it's serene landscape and beautiful natural wonders and there is no end to the amount of amazing, once in a lifetime sights to see. 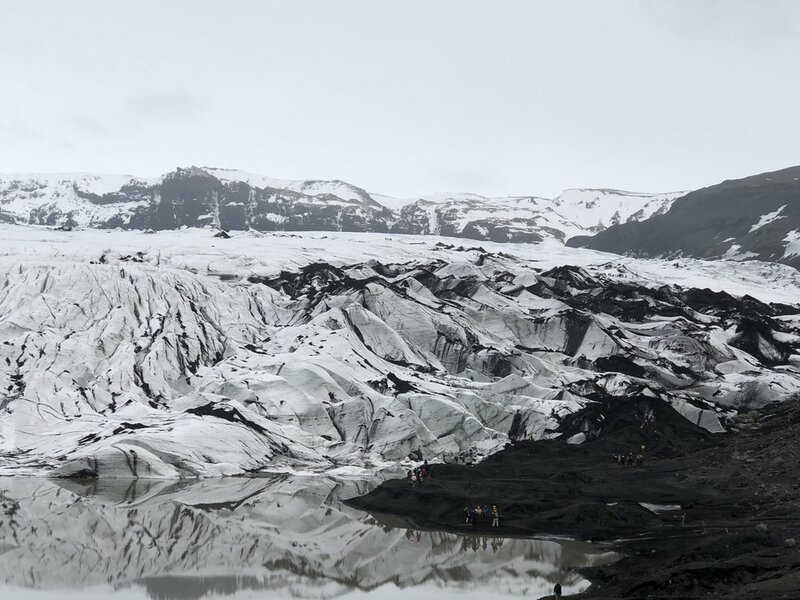 This list will break down a few of our must see/do list while in Iceland. Of note, we booked all of our tours through viator.com. Not only were they the best prices around but they were efficient and organized which made the whole trip that much more enjoyable! This all day, action packed tour took us through the southeastern part of Iceland. We started out with an early morning exploration of a volcanic cave. There was lots of crouching, sliding, and some crawling involved but man was it fun! Check us out! 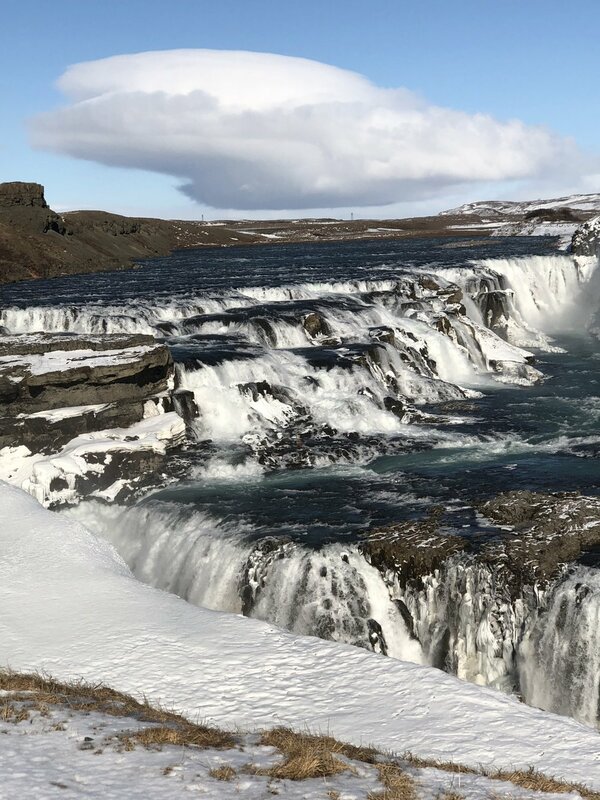 After a much needed lunch, we were refueled and ready for our afternoon which consisted of a hike around Thingvellir National Park, watching the roaring cascade of Gullfoss waterfall (insanely beautiful! ), and awed over the massive Geysir eruption in the geyser fields. Because our tour guide was phenomenal (seriously Icelandic Adventures is the best!) we made a quick pit stop to feed and faun over some Icelandic horses. This tour was a spur of the moment decision for us, we had booked and planned our entire trip prior to coming, leaving ourselves 2 free days in our week long vacation in case anything interesting appealed to us, and thank goodness we did! During our brew tour, we met a really cool couple who had taken this tour the previous day and raved about it, so we knew we had to check it out on one of our free days! 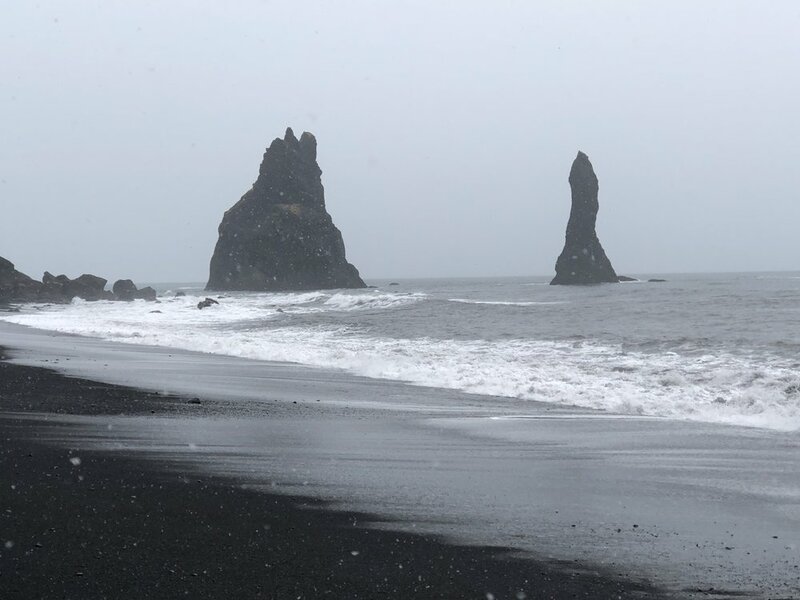 Next in the tour was a stroll along the black sandy beaches of Reynisfjara. This unique beach is comprised of basalt lava and is utterly breathtaking. After a quick lunch in Vik, we headed out for our glacier hike at Solheimajokull Glacier. This serene and peaceful site looked like something from a land before time. You can totally imagine you are the other person in the world standing looking at the rolling hills and snow white ice. Now after all those days of hiking, and sightseeing, you would be insane not to take an afternoon to soak and relax at The Blue Lagoon geothermal hotsprings. Your entrance fee gets you admission into the facility, one towel, 2 drink vouchers, and unlimited volcanic ash face masks. We soaked our weary travel bones until we were sweaty prunes, and then soaked some more. With a swim up bar, we could honestly have stayed forever. The steamy haze and sheer size of the pool made the experience intimate and despite the crowd when checking in, spacial and relaxing. It was definitely one of our more memorable experiences. You all know by now that we are huge self proclaimed foodies who make it a mission to try all the local cuisine, including, strike that, especially the strange and unusual. Singing up for a food/beer tour will definitely knock off some of those must eat items from your list. We booked one that paired a local brew with a local sample sized serving of food. Expertly timed courses and great explanations of flavors, this was a fun one. If you want to wing it- we recommend checking out this restaurant which offers a seven course meal which highlights all the unusual foods Iceland has to offer. We chowed down on horse, puffin, and whale to name a few. The step price tag of 70USD per person was worth it in my opinion to sample all these rarities in one stop. You can't visit Iceland and not try to catch a glimpse of the illusive Northern Lights. Hailed as one of the seven wonders of the world, this scientific phenomenon is simply put, magical. Our nighttime tour took us several hours outside of Reykjavik to literally, the middle of nowhere. Our gregarious tour guide kept the late night ride entertaining with old folk lore, Icelandic facts, and interesting stories along the way. While they (obviously) can't guarantee that you will see the lights, they do everything they can to make it the best possibility (they have scouted out several prime locations, kept a close eye on cloud coverage, and are flexible with viewing spots, etc) and will even offer to reschedule you free of charge for another day of your trip if the lights don't cooperate. While the lights weren't out in full force for our hunt, we did catch some truly magical glimmers. - Weekly Fleamarket, Kolaportið which is opened every Friday/Saturday and features some really unique hand crafted items including jewelry, wool sweaters, hats, etc. -Saga Museum: Play dress up like a Viking and enjoy this 50 minute self guided tour through some of Iceland's history as depicted through wax figures. -FREE city walking tours" You don't want to miss the opportunity to take advantage of a FREE walking tour all through downtown Reykjavik. Sponsored by the city, this guided tour will show you all the historical spots around town in this two hour guided tour. -Elevator ride up to the top of Hallgrimskirkja church. Check out this view! -Puffin/Whale Watching Tours: Depending on what time of year you travel, be sure to check out the puffin and/or whale watching tours. This was a fun (if cold!) few hours on the sea and a good alternative to hiking around the countryside if you have physical limitations or just need a more relaxed day. Experience the beautiful landscape from the sea! Paris, City of Love... and many other amazing things! So as all of you know, we packed our backpacks and embarked on a 10 day adventure to Paris/Rome and now we are sharing our experience with you. I’m going to tell you a little bit about Paris, France. But, before I go into details, let me debunk the saying “French people are rude” or “Paris is not that great” which I sadly heard numerous times before we decided to experience it ourselves. Parisians are incredibly nice, and the city itself is nothing short of amazing. There are so many places to see that in all honesty, we probably needed a whole month to see them all!. Many locals went out of their way to help us out and to give us directions when they recognized a "we're lost" face- even when we didn't speak each other's language. All you have to do is be polite to them and they will be polite to you. This is perhaps my favorite place in Paris. The Louvre Palace was originally built in the 12th century and extended over the centuries to what it is today; a magnificent, massive palace, home to thousands of the world’s most renowned works of art. The actual museum opened in 1793 and is divided into several wings, from Egyptian, Greek, and Roman antiquities, to Islamic art, sculptures, paintings, prints, and drawings. You can see world famous paintings like the Mona Lisa by Leonardo DaVinci, to Greek art masterpieces like the Aphrodite sculpture (The Venus de Milo). There is so much to see and experience in the vastness of this museum that it can be a little overwhelming. The Napoleon III apartments are a must see area of the Louvre. The extravagance and magnificence of the exhibit shows you how luxurious it was to live in this palace. I can totally picture myself living here (as a princess in a fairy-tale). Oh! and don't forget to stroll by the "carousel" and see the, also very famous, inverted pyramid. It's beautiful! Equal parts amazing and macabre; the underground Paris Catacombs are definitely something different. Get there early (before they open!) so you don't have to wait too long in the line. We got there thirty minutes before opening and still have to wait over one hour to get in. When you enter, you have to go down, and down, and down a spiral staircase that seems never-ending (So beware if you are claustrophobic), but it's worth it! There are miles and miles of underground tunnels and secret passages under the city of Paris and most of it is covered by the bones and skulls of more than 6 million people. 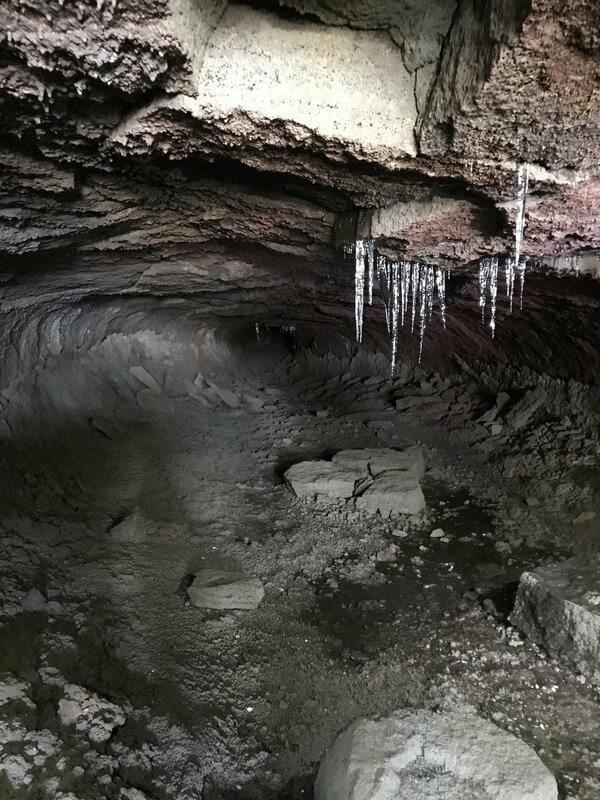 Of course, only a portion of these tunnels are open to the public, but it is still shocking to see this osseous display with your own eyes. Back in the late 1700’s when the cemeteries of the city were overflowing with centuries of dead Parisians, mostly from disease, famine, and wars, millions of remains and bones were transferred to the underground tunnels, establishing the largest ossuary in the world. They say there are several secret entrances around the city, and if you are not an expert in the tunnels, better not attempt to explore the non-public areas of the catacombs on your own…legend says a man got lost in the catacombs in the late 1700’s and died without finding the exit. 3. NOTRE-DAME DE PARIS CATHEDRAL. Everybody has heard of Esmeralda and Quasimodo, right? Well, Our Lady of Paris (exact translation) is one of the most beautiful medieval/Gothic structures you can visit. It is surreal to think that you can step foot in a building that has stood tall for so many centuries. Construction began in 1163, but it wasn't until the mid-13th century that the design and the façade were completed. You can appreciate the magnificent Rose window and the Cathedral’s gorgeous inside. The Gothic architecture and the many engravings, and sculptures will keep your jaw dropping. We took an extra step (or 387 to be exact) and climbed all the way to the dome. I mean, you can’t go to Notre Dame and not see the very famous Gargoyles! It was a narrow, endless spiral staircase to the top, but we made it. After shaking the claustrophobic moment off, you can see it was well worth it when you catch your first glimpse at the amazing Gothic gargoyles. They have been watching over the city of Paris for centuries and they are still standing. Another quick step inside the bell tower (another smaller staircase) and you can see the Cathedral’s majestic bell. But, just so you know, this part of the tower is (all) a wooden structure, so you will feel it move underneath you. Or that could’ve been my legs feeling like jelly after going up 31 flights by foot. I get it. You can’t be in Paris and not see the very famous Eiffel Tower. Located on the Champ de Mars in Paris, this gigantic iron tower was built in 1889 as an entrance to the world’s fair. When you are under it, you can actually feel its energy and magnificence on your own body. Security was very high when we went (the EuroCup 16 was in effect), and Paris celebrated with European soccer fans by hanging a colossal soccer ball from the tower. We didn’t go up to the floors allowed to the public, but we enjoyed some good ice cream, and shopped for souvenirs at the Champ de Mars. Dedicated to the Sacred Heart of Jesus, this basilica built in the late 1800’s, sits on top of the butte Montmartre, which is the highest point in the city. Prepare to walk up many, many steps, since the roads that lead to this point are filled with stairs. There’s no avoiding this fellows, so get your legs ready. You can take a little funicular car (your metro ticket will work for this one) to the top of the hill. Once you reach the top, you will be amazed by the view. It’s totally worth it. After your visit you can stay in the area and visit the little museums and galleries nearby. My favorite, the Dali Gallery, is within walking distance of Sacre Coure. Bonus tip, wear comfortable shoes when sightseeing in Paris. You will do a whole lot of walking and stair climbing. We walked and got lost in the gardens (yes, they are that big), ate lunch at one of the several little restaurants, and rented a row boat for a romantic sail in the Palace's Grand Canal (it is so big, it took 11 years to be built). By the way, this is a must do! So the next time you are in Paris, don't hesitate to visit all of these places and take lots and lots of pictures! Fellow travelers, what are your favorite parts of Paris? So Mia and I just got back from a whirlwind 10 days in Paris/Rome. When I tell you this trip was PHENOMENAL! With only 3 days in Rome, we really had to make good use of our time to see everything on our "must see" list but surprisingly we also discovered a couple neat little gems along the way (which of course, I'm going to share with you guys!). So here is my list of the top five things to do/see in Rome. 1) The Colosseum. Dating back to 70AD, this ancient structure is the home of bloody battles and torturous executions. Go ahead and pay the extra 6 euros to get a guided audio tour which provides interesting information on the structures architecture, the gladiators themselves, the fights, and other interesting tidbits of information. We got there about 30 minutes before opening time, 9AM, which I strongly recommend so you don't have to wait in long security and ticket buying lines. I was blown away by the sheer magnitude of the structure and that fact that it was almost 2000 years old. To think of everything it has seen and withstood over time is really mind boggling. 2) St. Peters Basilica- Built in the 1500's, this basilica was constructed in the rumored place where St. Peter was tortured and ultimately crucified by Roman Emperor Nero in 64AD. The sheer size and attention to detail is simply breathtaking, not hard to believe you take into consideration that it was largely designed by the esteemed artist, Michelangelo. St. Peters Basilica is also is also the burial place of the much adored Pope John Paul II (now officially a Saint). You definitely don't need to be Catholic, or even a religious person, to admire the beauty and intricacy of this structure. If you are able, I strongly recommend you pay the few euros is costs to walk to the top of of the top of the dome and take in the panoramic view of Rome. I'm not gonna lie, it was difficult, and for someone who is deathly afraid of heights and super close quarters, it was a nail biting climb. The staircase spirals very tightly in places and is super hot (we traveled in June) but once you climb those 551 steps, the view is simply breathtaking. Take your time and walk around (enjoy the breeze and fresh air!) and snap a few pics before making your way back down again. The halfway point back down has the Vatican gift shop where you can stop in to purchase any number of items blessed by the Pope himself, rosaries, figurines, post cards, metals, prayer cards, anything you can imagine really. 3) The Trevi Fountain. Rome is famous for their numerous piazzas (plazas) with amazing fountains and quaint streets but the Trevi Fountain is a must see when in Rome. Day or night, this fountain is awesome either way (trust me on this- we went one day and the next night to compare). Make sure and take a coin to throw over your left shoulder, backwards which according to legend, means you will come back to visit one day. Located in the Pizaaas di Trevi (imagine that), this place is always packed, and at night the lights illuminating the fountain are so romantic. Street vendors come out at night to sell all sorts of wears from jewelry to Italian souvenirs. (Keep your purse/wallet/phone close- the area is ripe with pickpoketers!). 4)Palatine Hill: Just a short walk from the Colosseum, Palatine Hill is one of the most ancient places in the city dating back to 10BC. Be ready for a long walk, we ambled around these ruins for several hours, taking in the breathtaking beauty. Palatine Hill was once the home of various Emperors and nobility and have remained surprisingly intact over the past couple of thousand years! It was like walking through a movie set for a post apocalyptic movie, the flowers and green grass provided such a contrast to the obviously old and crumbling city around. Please don't skip out on seeing Palatine Hill while in Rome! Now I know I said this was my top 5, but I'm sneaking in this last spot because after all this running around Rome you are going to want a good spot to sit back, relax, and enjoy a good drink. The area of Rome known was Trastevere is loaded with good food and plenty of places to grab a drink. We enjoyed wandering the little streets and alleyways taking in the scenery and liveliness of the area. Known as a vibrant collage hangout, Trastevere is located in the 13th rione (district) of Rome. We picked a spot at a local bar and sipped Nagronis after a long day sightseeing, it was the perfect spot to unwind and take in the local atmosphere! **** Travel with us! read about our other adventures here! What are some of your favorite spots in Rome?! DID YOU LIKE THIS ARTICLE? Please let us know!!! show us your love for travel by sharing or commenting below!